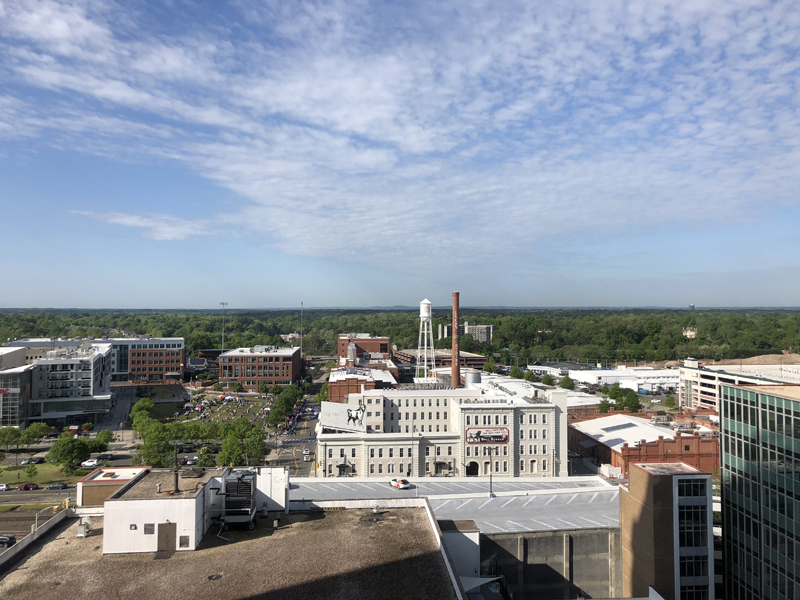 Durham, N.C., is so close to Raleigh, N.C.
I’ve loved Durham for years – mostly because of the time I’ve spent downtown for the Full Frame Documentary Film Festival each spring. It’s one of my favorite places and times of the year. I lovingly call Full Frame my film school because it has taught me so much. Derek and I celebrated our fifth wedding anniversary in Durham, N.C., this spring. This is how we did our honeymoon in Asheville, N.C., years ago. We’ve tried to keep that same pace for our anniversary trips each year. Having a baby recently amped up that need like whoa, too. We really wanted to chill. For a while, we debated about going to the beach. (We went to Wrightsville Beach, N.C., last year.) I have been in desperate need of some water views this year. But I haven’t found many beaches that also have fine dining options, and we also really wanted to eat well. Don’t get that confused. Some of my favorite foods are at the beach, especially in North Carolina. I’m a down east girl who looooves seafood. But we were looking for a very specific dining experience with proximity to home so we could make the most of our time away as new parents. Despite both of us spending time in Durham, N.C., we had never gotten a lot of quality time there together. He thought it’d be the perfect quick getaway, and started getting recommendations from people. Boy, was he right. We got to Durham for lunch on Friday. Funny enough, we kept bumping into people we know, which was a sweet surprise. We felt like we were so far away from home, but knew that we were so close because of the familiar faces. It’s an oddly wonderful feeling. Derek and I had lunch at Pizzeria Toro. 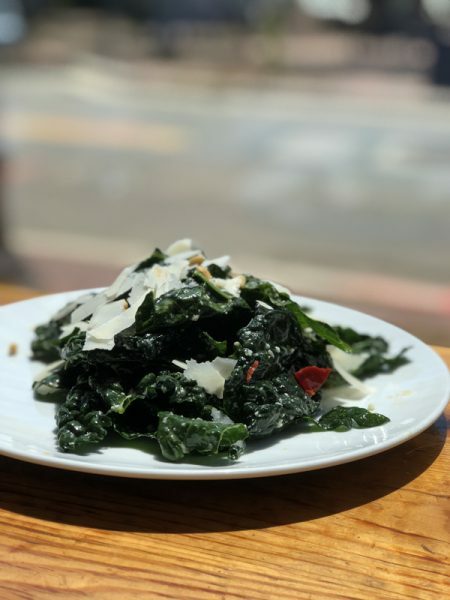 The kale salad at Pizzeria Toro is delicious. 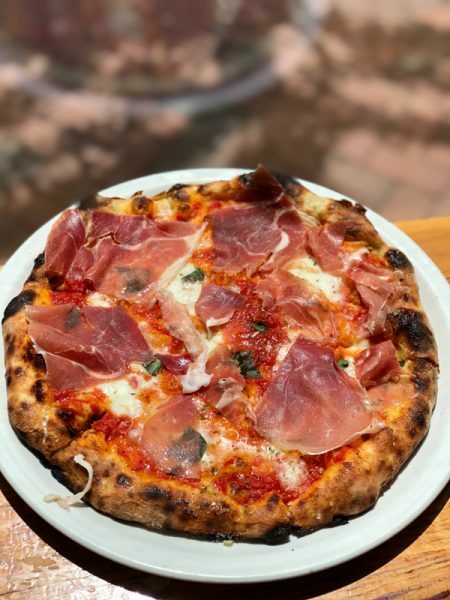 Pizzeria Toro reminds us of the pizza we order in Positano, Italy. After lunch we walked through some really cute shops. We stopped in Tiny, a children’s boutique. Next door is Chet Miller, which has an array of cute books and gifty-things. We stopped into a few other places, too. To ease into dinner time, we checked into our hotel. We stayed at the 21C in downtown Durham. It was alright, but not quite the delightful experience we were hoping for over the weekend. There were little things like a stained hand towel, frustration with a seemingly overwhelmed staff, and a luggage mixup that kept us waiting a little too long. The best thing about the hotel, in my humble opinion, was the artwork and the view of downtown. The view of downtown Durham, N.C., was one of the best things about our hotel in my humble opinion. After checking in, we walked over to Fullsteam. 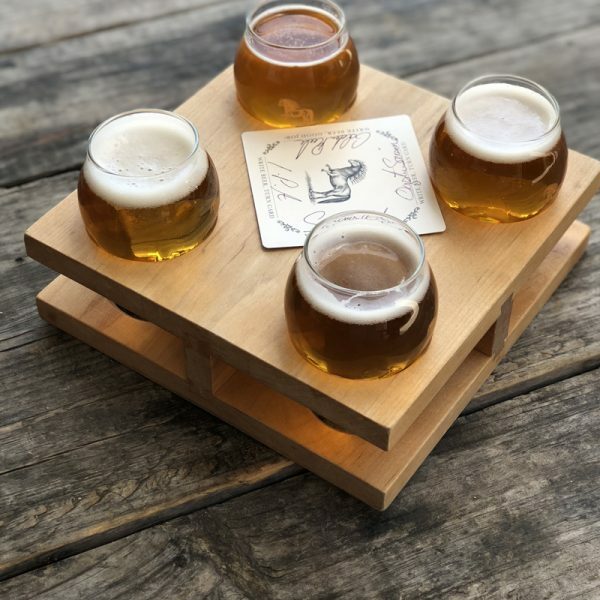 We shared a flight at Fullsteam, one of the breweries where I first started drinking craft beer. I’ve adored Fullsteam for a long time. The brewery was featured in the documentary I directed about craft beer, Brewconomy, because of the founder’s role in Pop the Cap. (Haven’t seen the movie? Rent it here.) Fullsteam is one of the places where I first started drinking craft beer. We had drinks at Fullsteam, enjoyed the fresh air, and slowly walked back to our hotel to get ready for dinner. For dinner on Friday night, we went to M Sushi. It’s next to The Durham Hotel (along the cobblestone pathway in between buildings). Derek and I love sushi, and heard great things about this spot. It did not disappoint. In fact, this is probably one of the best meals I’ve ever had. 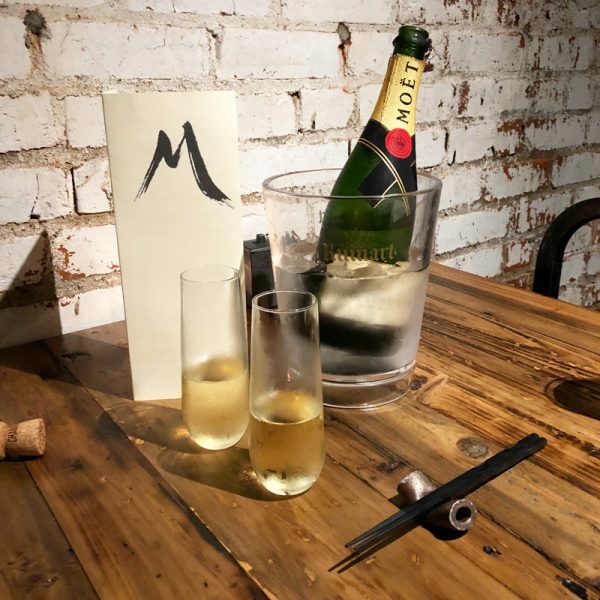 We ate dinner at M Sushi in Durham, N.C., and it was so delicious that I was a little speechless. We got sushi and it was delicious. The M Sushi roll was so, so good. I wish we’d gotten more sushi while we were there, but we really wanted to try other things on the menu without getting too full. 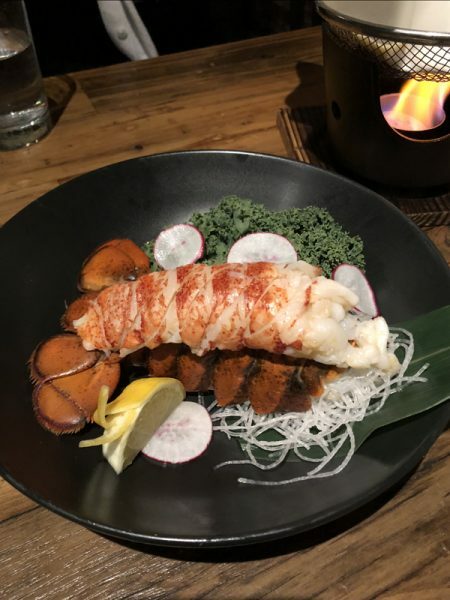 The lobster is served chilled and you warm it up in crustacean butter. We tried their lobster, Ishiyaki BBQ, and dumplings. 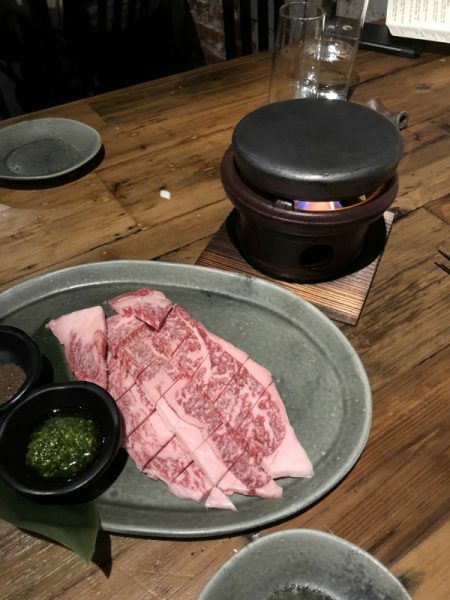 The Ishiyaki BBQ is A5 grade Japanese Wagyu beef cooked on a river stone table-side. The dumplings were scallop mousse, lobster, and truffle emulsion. 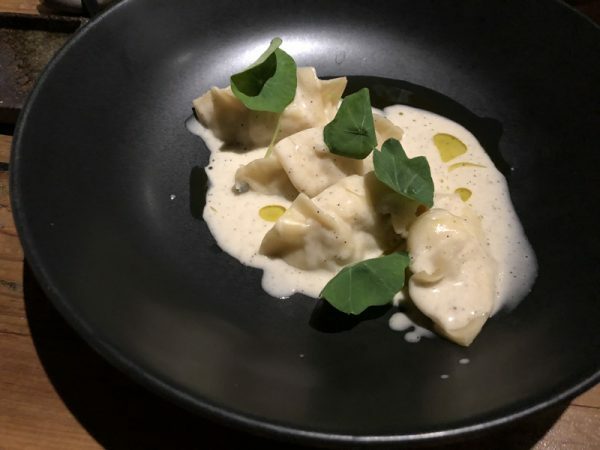 The dumplings were filled with scallop mouse and lobster, served with a truffle emulsion. The depth of flavor with every plate at M Sushi was pretty mind blowing. Every bite was so delicious. Very few meals have ever left me speechless. This was one of them. I just… I just don’t have the words. You have to go to M Sushi and experience it yourself. It was incredible. The A5 Grade Wagyu Beef was unlike anything I’ve ever eaten. It melted in my mouth. I want more. We ended our meal with a dessert. It was a chocolate mousse, if I remember correctly. I didn’t snag a description on that dessert, unfortunately, but you should totally save room for it if you’re eating dinner there. It was just as good as everything else we ate. 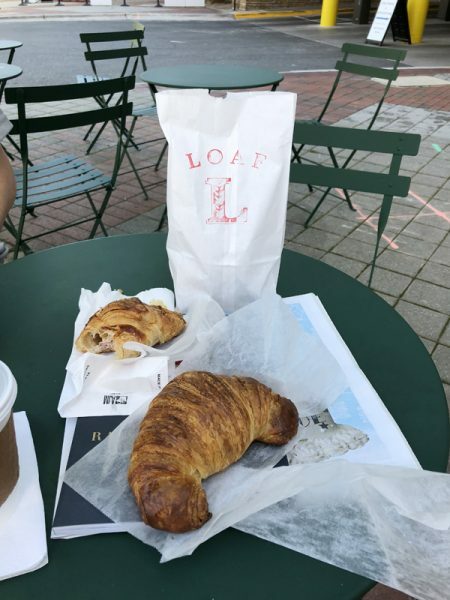 The next morning – feeling super refreshed after sleeping a solid night without a baby waking us up constantly – we walked over to Loaf to get fresh pastries. The pastries at Loaf were so delicious! Now, I don’t often eat pastries. That’s because I’m pretty picky about them. But they’re a luxury I indulge in while on vacation. Loaf had so many beautiful pastries, cookies, and breads on display that I wanted to order one of everything. You can also peek through to watch the bakery in action. The croissant and ham/cheese pastry we had were so delicious. We’ll definitely be going back the next time we’re in town. We skipped lunch on Saturday, since we were so full from breakfast! But we left time to stop by Ponysaurus for a flight. It was our last stop before leaving town. We were so happy to have more craft beer, chill time, and fresh air. We stopped by Ponysaurus as our last stop on the way out of town. While we were in Durham, N.C., we bumped into a few friends. One of them told us that she likes to “date her own city” and that’s an idea I can get behind. 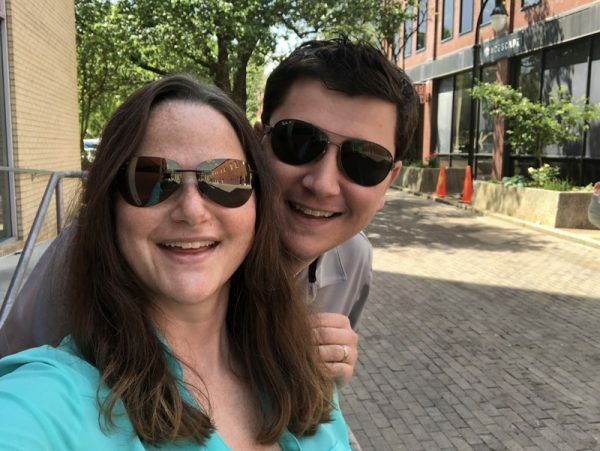 I loved spending a night in downtown Durham to celebrate our anniversary. I hope that we’ll keep exploring Raleigh, N.C., whenever we can. 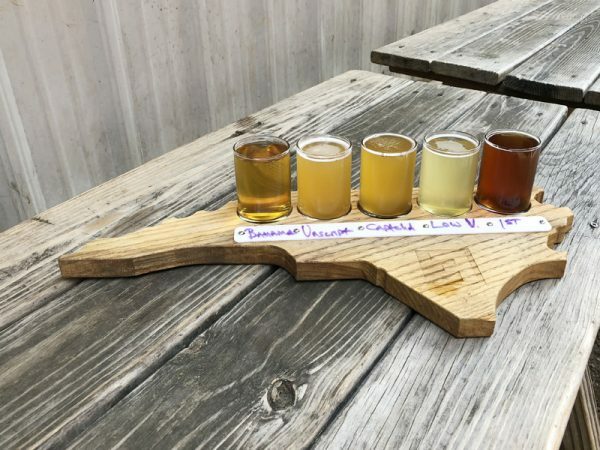 Do you have recommendations for cool places in the Triangle? I’d love to hear about them! Use the comments to tell me what you think.